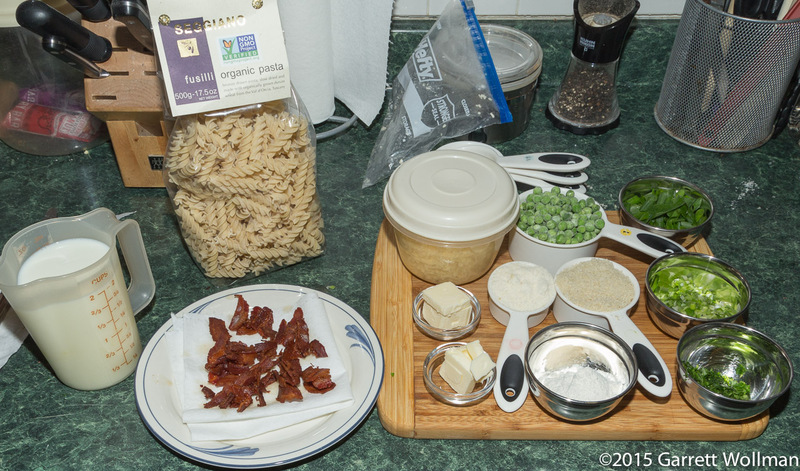 Starting, as always, with the mise en place, you’ll note that I’ve already rendered the bacon. I kept the bacon fat for another recipe — it will not be used here — and let the bacon drain on a paper towel. The scallions (left over from last weekend — otherwise I would have used shallot and/or yellow onion) were separated into whites and greens, and I minced the white part while keeping the greens in relatively large pieces. A variety of cheeses are appropriate for this sort of dish, but I chose cheddar as having a reasonably strong but not overpowering flavor and being easy to incorporate into a cheese sauce. 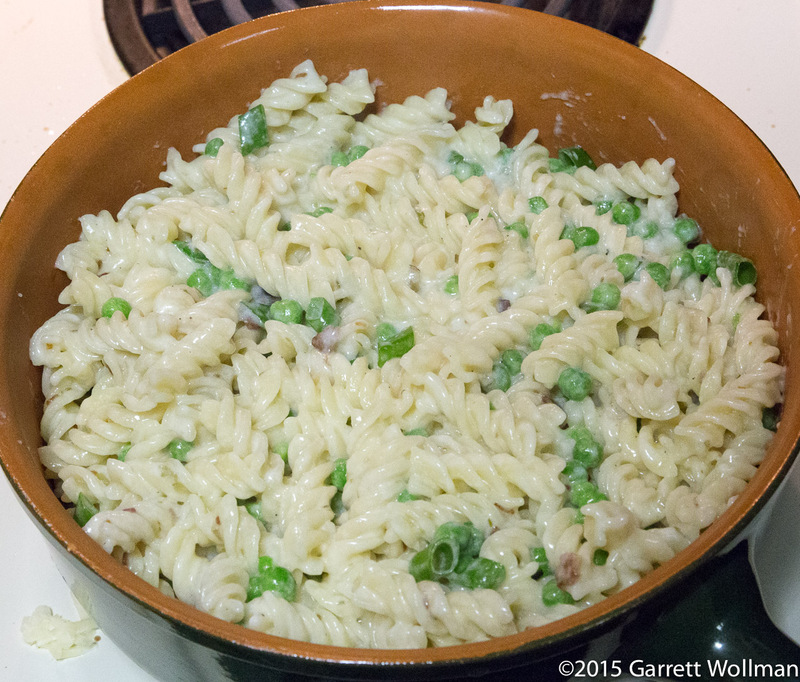 The peas were just leftovers. 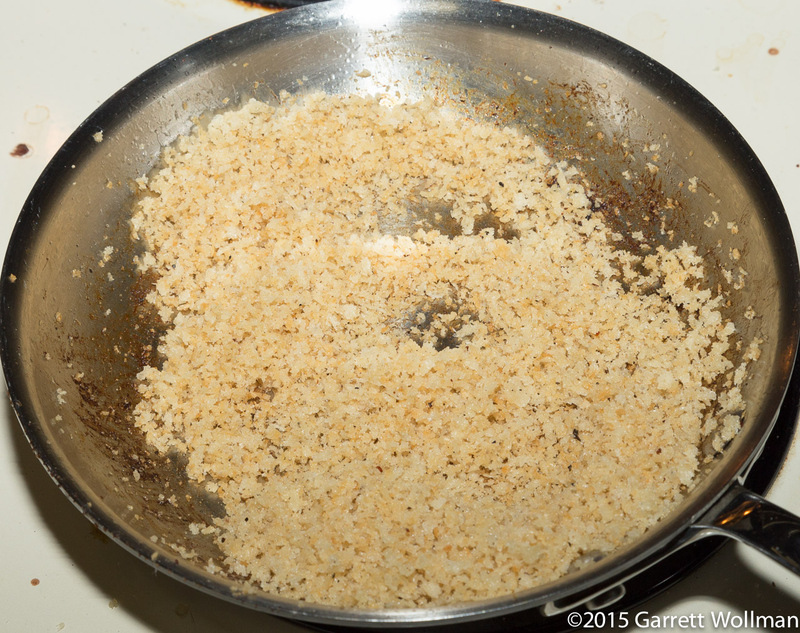 To start, I melted some butter in a small saucepan and used it to toast the panko. Panko generally doesn’t color all that much in the oven unless you really broil it, which I didn’t want to do — this dish is really pretty well cooked before it goes into the oven — so toasting it gives it better texture and color without killing the casserole. 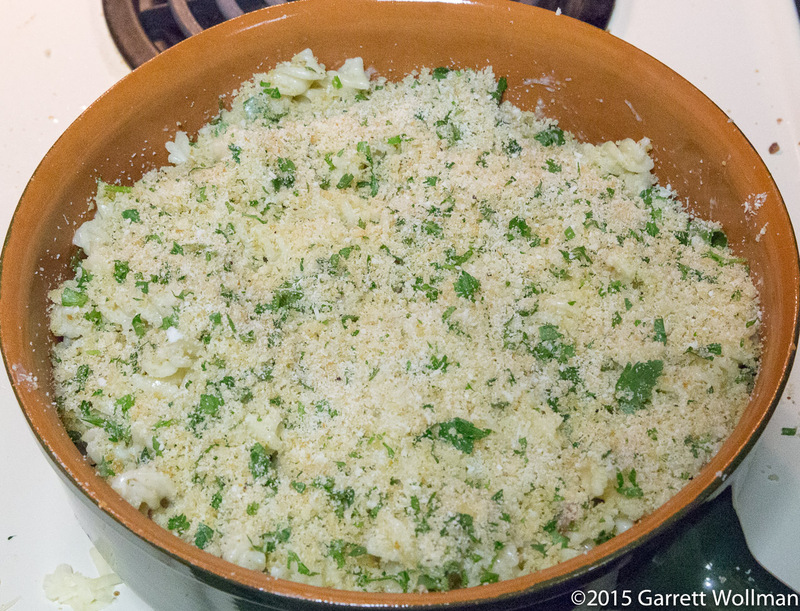 After toasting, I put the panko in a bowl, and once it was cooled, I mixed in the Parmigiano-Reggiano and chopped parsley. I spread the topping over the combined macaroni and cheese sauce, making sure to cover the entire surface, and baked the casserole at 350°F (175°C) for half an hour. It came out looking like this, which I’ll admit is not all that different from how it looked before it went in — but it was all completely heated through. I figured a single serving would be about one sixth of the casserole. Not sure how well I did — but you can see quite clearly that more cheese sauce and less pasta would have been an improvement. 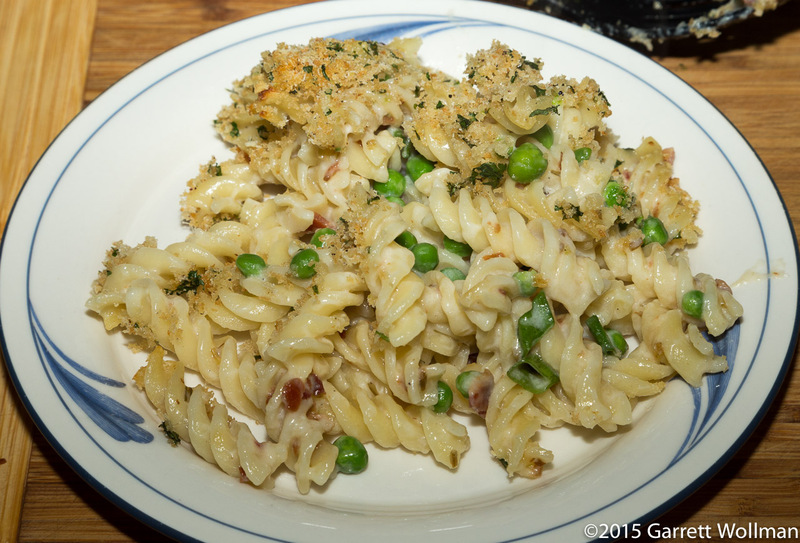 But what sauce there is does cling nicely to the fusilli, so I got that part sort of right, anyway. And the taste was pretty good, although again because there was too much pasta it’s hard to say definitively whether there was enough of the other ingredients. Next year maybe I’ll try something more complicated from the Spieler cookbook and see how it compares. This will need recalculating for a smaller amount of pasta (or else a larger quantity of cheese sauce, should you choose to go that route, but I think the former is easier). The calculation below doesn’t reflect the amount of salt and pepper I added, and other herbs and vegetables could certainly be used depending on your preference. 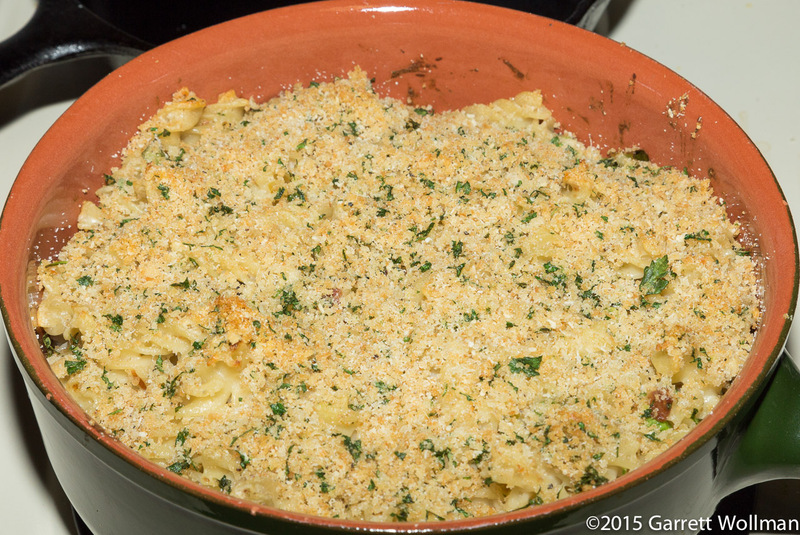 This entry was posted in Food and tagged casserole, macaroni and cheese, pasta, recipe. Bookmark the permalink.